The Green, Yampa, and White rivers, all Uinta Basin tributaries of the Colorado River, inspire poetry, prose, and art like beautiful rivers everywhere. But these are our rivers, the rivers we know, and they have ispored our experiences: memories that have lived long, taught lessons, and changed lives. As resident of this valley, they are something we all share, our lifeblood. 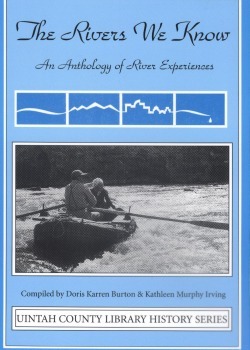 Included in the volume are tales of adventure, tragedies and near-misses, delight in beauty and solitude, unadulterated fun, and childhood impressions of swiftly-moving river monsters. There are stories of whitewater that destroyed boats but created ingenious men, of fish that were river whales but have nearly disappeared, and of ferries that once connected human lives but now are only memories. Some are hilarious, others are heartrending, but all capture our imaginations. This anthology is collected and published as a Uinta Basin tribute to the rivers that are so much a part of each of us, rivers that provide so much more than just water to an arid desert. Paperback, c2002, xii, 191 p. : ill. ; 15 cm.